We’ve been here for a few months now but it wasn’t until we had two sets of visitors in the last two weekends that we got to put our tourist hats on for a little bit. Of all the choices that you have to spend your time on here in Dubbo, these are our four ‘Best Of’ picks. Of course, I’m talking about Taronga Western Plains Zoo. Located just 5km out of town this zoo is the sister zoo of Taronga Zoo Sydney and was built back in 1977 primarily to house the plain grazing animals that needed lots of space, and as a breeding facility. Calling both this zoo and the one in Sydney ‘Taronga Zoo Sydney’ and ‘Taronga Western Plains Zoo’ is just confusing to me. 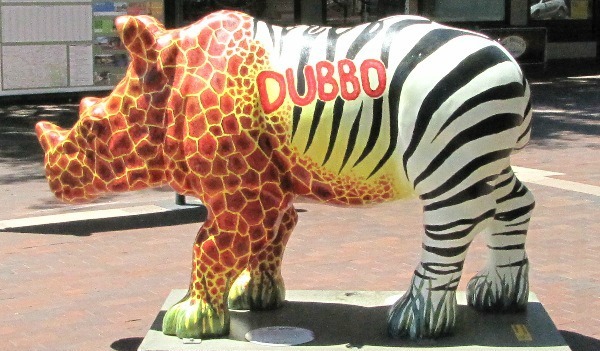 In case you get confused, this zoo often gets called ‘Western Plains Zoo’ or ‘Dubbo Zoo’. The zoo was based on the open-range design, which uses moats to separate visitors from the animals, largely negating the need for fences and bars. Here’s our tips for planning your zoo visit. The zoo is open every day of the year (including Christmas Day) from 9am-4pm. 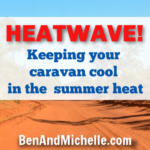 If the weather is still warm, then I would recommend getting there as early as possible to avoid the hottest part of the day. I know that avoiding crowds applies to any tourist attraction, but if you have the choice, try and avoid them. We went on Good Friday and I’m so glad we did. It was a nice morning for us, with not too many other people, but we heard from some of the zoo staff (and friends who went on the Saturday) that it was crazy busy on the Saturday and Sunday. You have four options for getting around the park to see all the animals. There is a 6km circuit that is sealed all the way round. Bike – You can hire bicycles at the zoo for just $15 per person for the whole day. They have loads of bikes and they’re in reasonable condition. Helmets are provided and you can also hire caboose to tow your toddlers. If you’ve got your own bicycle you’re welcome to use that. Cart – electric golf carts are $69 for three hours and can take 4-6 people. Walk –you could happily plod your way around the circuit, and for the first half we were on and off our bikes so much that we wish we had walked. But by the time we got to the back half of the circuit where there were more of the plains dwelling animals (with longer stretches between each enclosure) we were glad to be on bikes. Car – You can take you car into the park and drive the circuit. 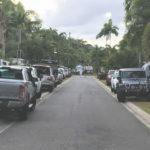 Since we were there on a non-busy day it looked like there was no problem with parking, but I imagine that on really busy days it might get a bit annoying trying to find a spot close to the exhibit you’re wanting to see. You can bring your own picnic lunch into the park. Or there are a couple of kiosks around the park where you can buy food. The main visitors plaza near the carpark and ticket counter has a café and surprisingly enough, the prices weren’t eye-wateringly ridiculous like many other tourist attractions. (I’m not saying it was cheap, not by any stretch, but it wasn’t ridiculous and the food that I saw coming out of the kitchen looked good quality with lots of options. This is a great zoo. It’s so good to see all the animals in a habitat that is more reminiscent of their natural homes than the iron bars and concrete floors of many other zoos. While I’d much rather catch a glimpse of these magnificent animals out in the wild than cooped up in a zoo, it’s encouraging to know that Taronga Western Plains is doing some very important work in preserving many of these species through their breeding program. 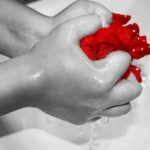 We have received a few recommendations that this restaurant serves the best Chinese food so we went along to check them out. The Macquarie Club Chinese Restaurant is part of the Macquarie Club – Dubbo, a bowling club situated at 313 Macquarie St, Dubbo. We went on a Tuesday night and there were plenty of tables (we did eat early though, 6pm) and though the décor is dated (think 90’s pastels), the service is friendly, prompt and the prices, very reasonable. A good sign, to me, was the number of people coming in to pick up their takeaway orders. There was a steady stream of people so the kitchen was kept busy even though there was hardly anyone in the restaurant. Can I still call it a ‘best’ walk when it’s really the only walk in town? Head on down to the river and do the Macquarie River Run Course. It’s a loop of just 5.4km and follows the banks of the river. 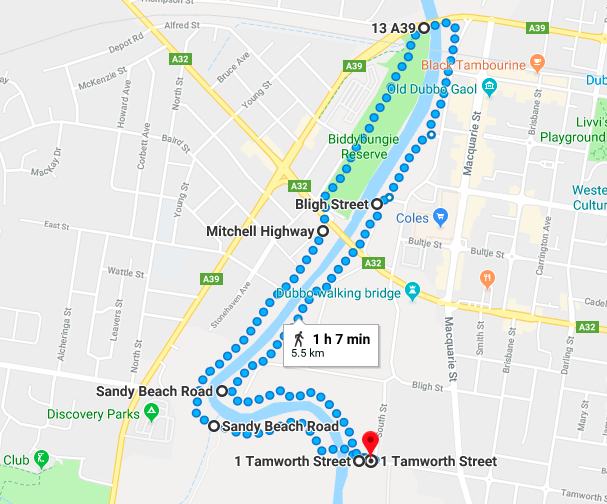 We park at the end of Tamworth St and head straight over the footbridge doing the loop in a clockwise direction. It’s lovely. For the perfect brunch (or post-walk lunch) with superb coffee and delicious food, I would head straight to Press, on Bultje Rd, Dubbo (yep, I have no idea how that name is pronounced). So there you go, our Best Four in Dubbo. 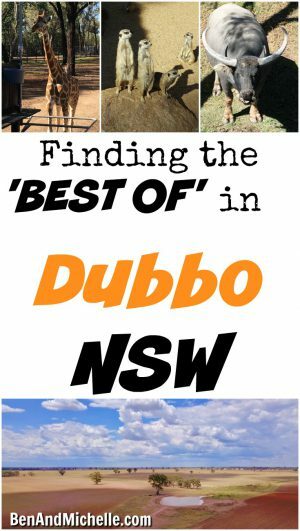 Have you been to Dubbo? 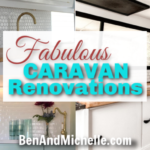 And which places make it into your ‘Best Of’?